Netflix Ransomware is a dangerous threat that might first look like harmless software that could help to generate a Netflix account and thus watch Netflix for free. It might look useful because it is distributed as a free Netflix account generator. Since users expect this generator to be beneficial software, they download it willingly and, unfortunately, allow this ransomware infection to sneak onto their computers. Users quickly realize that they have downloaded malware rather than a useful program because they find a ransom note dropped on their computers. It claims that all files have been encrypted with a strong encryption algorithm AES-256 and a certain amount of money has to be paid to unlock and get those files back. The version specialists working at pcthreat.com have tested does not lock any files but a ransom note is still dropped on the system, meaning that this infection tries to scare users into paying the required money only. Of course, the fixed version encrypting users’ files might be released by cyber criminals in the near future too. No matter which version of Netflix Ransomware you have encountered, do not send money to cyber criminals by any means. Instead, go to delete this computer infection as soon as possible. Users do not immediately understand that they have downloaded malware rather than a Netflix account generator. It is because they first see a window with the Generate Login! button and a Netflix label when they launch the malicious file. Once they click on this button, a pop-up window Account Info containing Username and Password appears. Do not celebrate too early – these login details are fake. You will see that yourself if you try to connect to Netflix. 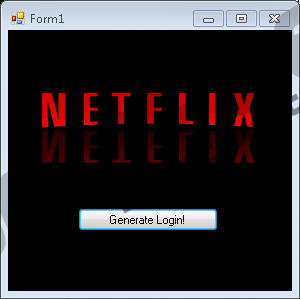 According to specialists, Netflix Ransomware should encrypt files after users click on the Generate Login! button, which explains why cyber criminals try to lure them into doing that; however, Netflix Ransomware does not encrypt data at the time of writing. It might be some kind of bug, e.g. a problem with the C&C server, or cyber criminals use the so-called scare tactic only rather than taking serious action. Even though this malicious application does not encrypt files, users still find ransom.jpg, which tells users that their files have been locked and tell to open the .txt file, set as Desktop background. On top of that, a file open instructions.txt is dropped on Desktop. Users are informed there that they can unlock files by sending $100 in Bitcoins. As has already been told, it is very likely that your files have not been encrypted, so there is no point in transferring money to cyber criminals too. If it happens that your personal files have been locked, try to unlock your data without the key crooks claim to have because there are no guarantees that the decryptor will be sent to you. Yes, users might lose their money too. According to researchers, there are two ways Netflix Ransomware is spread. First, it travels as an attachment in spam emails. Users are not told that malicious software is attached. Instead, it is promoted as a Netflix generator, which explains why so many users open such an email attachment fearlessly and allow malware to enter their computers without realizing that. Also, users could have downloaded this infection themselves too from a bad website promoting malware. Of course, Netflix Ransomware was advertised there as a useful application that could help to get a free Netflix account. There are thousands of different infections promoted as beneficial software these days, so users should be extremely careful. Our security specialists have two pieces of advice for users who wish to have malware-free PCs. First, ignoring all spam emails is a key to having a clean computer. Second, the installation of a reputable security application is also highly recommended. We recommend installing SpyHunter for this matter. 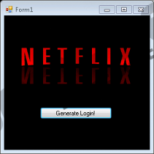 Once Netflix Ransomware successfully enters the computer, it places its executable file netprotocol.exe (size: 133 632 bytes) in %APPDATA%\Microsoft\Windows\screentogif, sets ransom.jpg as Desktop background and places it in %USERPROFILE%, and, finally, it creates the .txt file with the information on how to decrypt files on Desktop. All these files have to be erased one by one to fully delete Netflix Ransomware. The manual method is, of course, not the only one that can be employed. Users can also go to remove this computer infection automatically with an automatic malware remover. If an automatic scanner is used, it will also delete all other infections performing activities without a user’s consent from the system. Find and remove a suspicious recently downloaded file (it might be hiding in %TEMP%, %APPDATA%, %USERPROFILE%\Desktop, %USERPROFILE%\Downloads, etc.). Locate the executable file netprotocol.exe and delete it. Remove the file open instructions.txt from Desktop. Quick & tested solution for Netflix Ransomware removal.